After publicly demanding a trade from the Wolves right before the start of the regular season, Jimmy Butler has definitely burnt through a great deal of his popularity in Minnesota. But he’s prepared to face whatever welcome the fans are willing to give him during the team’s home opener against the Cavaliers on Friday, according to Jon Krawczynski. Up until his absurdly dramatic return on Wednesday, Butler had been away from the team after demanding a trade from the Timberwolves because he didn’t believe his teammates—particularly Andrew Wiggins and Karl-Anthony Towns—were working hard enough. Initial reports said teams such as Knicks, Clippers and Heat were interested, with Miami in the lead. 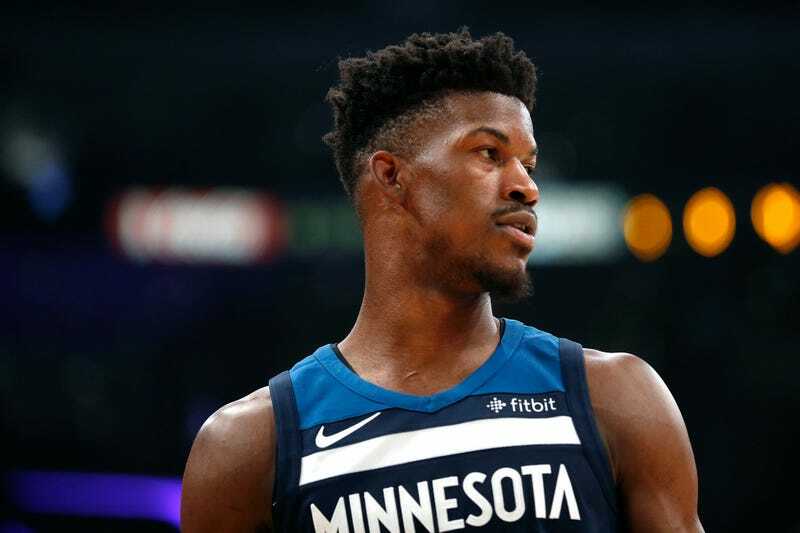 But earlier today, Shams Charania tweeted that trade talks between Miami and Minnesota are dead, for now, and that Butler is expected to play at the team’s season opener on Wednesday at San Antonio. This could have easily been solved much sooner if Tom Thibodeau had decided to budge on moving his disgruntled superstar. Instead, seeing the writing on the wall about his future in Minnesota, Thibs decided to do everything he could to try and keep Butler so that the team would at least compete in the standings as it implodes from the locker room. Now, there’s a situation where the best player on a team is willing to accept a shower of boo’s at his team’s home opener not because of poor playing, or any heinous off-court actions, but because of horrendous front office management. There’s also the fact that he decided to focus his frustrations at the team’s next generation of talent by humiliating them in a public practice. But even with all of the fault Thibs has in this, you have to wonder what Butler’s end game is here? He does have some superstars on his side about this mess, and he is still an elite-level talent in the NBA, but this whole fiasco certainly hurts his trade value. Even during his time in Chicago, Butler was openly calling out teammates about their work ethic, so this behavior appears to have become par for the course with him. There aren’t many locker rooms in the league that could handle that mess, and even fewer that would want to take that on. So, why? Maybe it’s spite. Maybe he’s quietly expressed to other teams he’d be willing to change. None of that is clear. What is clear, however, is that he’ll get to feel the emotions of the fans whose team he’s putting through utter turmoil. Perhaps it will get ugly enough that somebody blinks sooner than they want.